I wanted to write a personal/ fun post on Sprucenews today. I wanted it to be different from the usual and perhaps share a little more of who I am and my personality. It's call 10 things that annoy me, but some of these actually really gross me out! We all have pet peeves, things that can really grind our gears and push us the wrong way. It's just a natural thing, I think everyone has them. OK some of us may react in a slightly more hysterical (over the top) way, but regardless.. we all have things that annoy us. 1. SPITTING - This is one of those more disgusting habits that I cannot stand! I understand that sometimes it is necessary... but if you choose to just spit for no reason whatsoever just URGH! 2. FEET - Okay this is more of a personal thing, I don't like my own feet.. I don't find them attractive! But, maybe that's more of a personal self hate of mine. I have long toes that my brothers and boyfriend call fingers to wind me up! It's funny.. but secretly I hate it. 3. SMOKING - I think I speak for many of the non-smokers out there... It's just a smelly, harmful habit that causes not only life threatening illnesses, but also litter! THROW YOUR CIGARETTE BUDS IN THE BIN PLEASE. Oh and I would rather not have your passive smoke which could potentially harm my lungs and give me cancer one day. Thanks. 4. PEOPLE DRIVING CLOSE BEHIND YOU - Okay, so if you're a driver you know that this is 1) NOT SAFE and 2) highly irritating. Why are you so close to my car?? *This is where road rage kicks in! 5. PEOPLE WHO EAT WITH THEIR MOUTH OPEN - This could potentially be one of the most disgusting things ever.. Do I need to see your food on your plate and then in your mouth? NO! 6. LEAVING A TISSUE IN YOUR POCKET AND PUTTING IT IN THE WASHING MACHINE - I don't know about you, but this is one of the most annoying things I have done. Not only can you never get the bits of tissue out of your pocket, the tissue sticks to other clothes. 7. TREADING IN DOG POO - This is both gross and annoying - not only does it smell but you have to clean your shoes.. or bin them! If you have a dog and it poos in public CLEAN IT UP! 8. TEXT TALK - I used text talk when I was about 15! Now, 10 years on I find it so irritating. Why not just spell the entire word? I don't know if this is just a pet peeve of mine or other people agree with me. But, I get so annoyed. *Maybe I am just not cool any more. I don't understand what half of the words mean any more and I think this could have potentially been part of the reason my writing skills weren't very good in school. 9. RUDE SHOP ASSISTANTS - I had to include this in my top 10. It doesn't take much to smile, be polite and get on with your day. When a shop assistant is rude and unhelpful it looks bad on the company they work for and themselves. 10. STUBBING YOUR TOE - There is nothing worse and it is always when you forget your slippers! 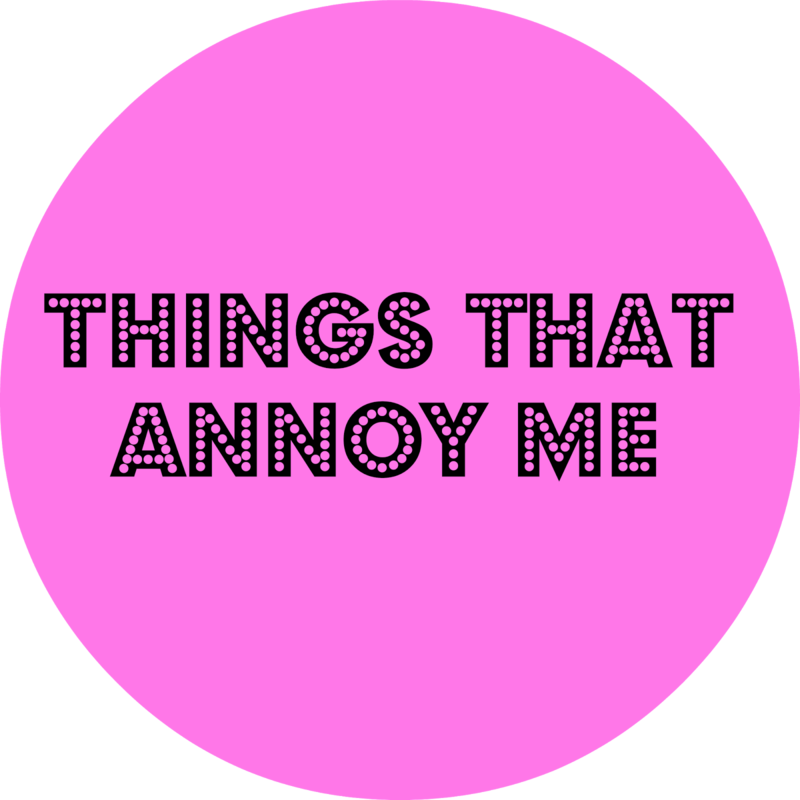 What is on your top 10 annoying things list?